This was my 6th marathon and I cut off 3 minutes & 22 seconds off of my previous PR that I set 5 months before at the Las Vegas Rock 'n Roll Marathon! I finished in a time of 3:52:11 with an average pace of 8:52 and finished 9th in my age group and 31st female overall! 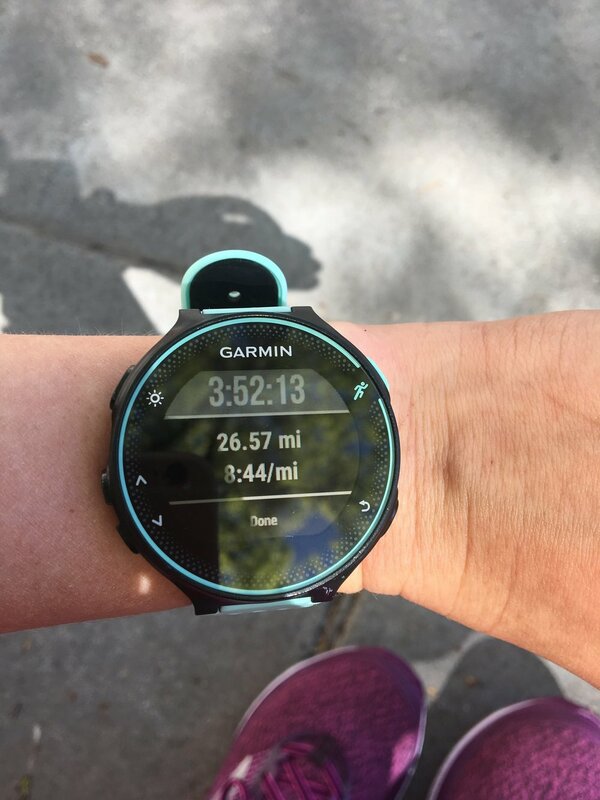 I was a bit nervous before this marathon (I always am...) and was unsure what my goal time should be! I followed the Hanson's Marathon Method again (I did for my Rock 'n Roll race as well) and peaked at 63 miles. 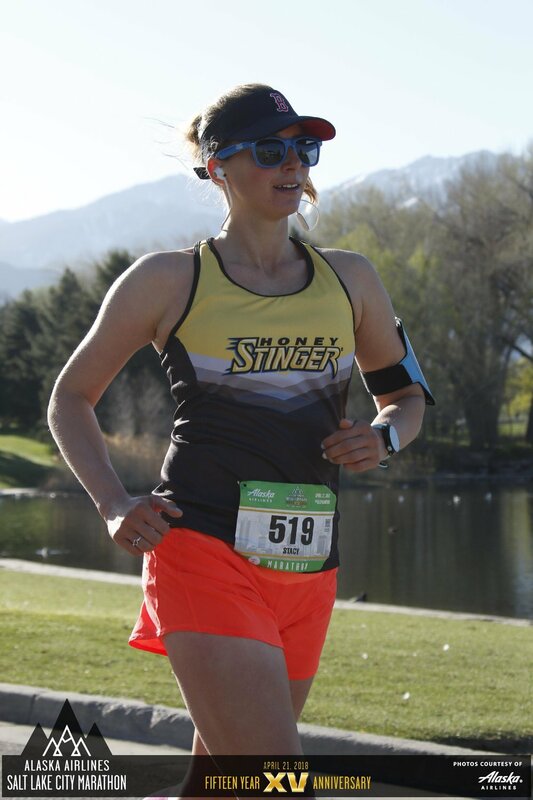 I was following a plan to break 3:40, but because I had my MS Run The US Relay Segment in less than a month after this race, my goal was to stay injury-free first and foremost and have a great experience (before setting a new PR). I knew I was in great shape and could have gotten close to that 3:40, but wanted to play it safe! My other main goal was to have a faster second-half (negative-split). While I didn't exactly negative-split, (my first half was 1:54 and second half was 1:57) the splits were MUCH closer than previous marathons (my second half would be as much as 10+ off my first half). The race was to be a net-overall downhill course with some hills in there. I thought it would be a great challenge to run some hills (my first for a marathon- besides my first marathon, Steamboat Marathon!) and it ended up gaining 841' in elevation (according to my garmin). Alright, so let's go back to the start of the race. I got up at 4:45am (we stayed near the airport) and ate some oatmeal (heated water up in the coffee maker in the hotel room) and foam rolled everything out (along with A LOT of deodorant to prevent chafing- works WAY better than body glide! I didn't have one chafed spot after the race). We left the hotel at 5:20am and planned to drop me off at the library square tram stop (all race participants got free transportation on it the morning of the race and this stop meant I wouldn't have to change trains at all which was MUCH easier). I got on the tram by 5:45 and arrived at the race start a few minutes before 6 (the race didn't even start until 7!). They had the bikers start their race at 6am, so I got to cheer them off and also enjoy clean porta-potties..win win! I did a bunch of stretching, drank my Nuun Energy (contains caffeine)/ mixed with coconut water and had a banana. It was still pretty chilly out (I brought an old fleece jacket to wear before the race start and then put it in my drop bag) before the race began (around 50*), but I used the bathroom one more time (way more racers started to arrive by 6:30) and dropped my bag by 6:45. I got to the start and was in corral B! I've never been so close to the start line before- it was crazy intimidating! The national anthem was sung and we were off 30 seconds after the first corral. There was a small hill in the first 1/2 mile, which certainly got the legs warmed up! I opted to wear my new Brooks Ghost 10 (hadn't worn them yet) with my used Superfeet insoles. I know you're technically not "supposed" to race in new shoes, but I've had 3+ pairs of these and with my broken-in insoles, I figured I was OK. My feet were actually numb and tingly for the first 5 miles, which got me pretty nervous (I was also really cold still- the race was in the shade) but it finally dissipated. The first 4-5 miles of the race were absolutely breath-taking looking over the city from the hills above. Then we started going down a crazy canyon (and not the best road- so many pot-holes), with a pretty steep decline. I wanted to not "fly and die", so had to keep focusing on my form and leaning into the hill, rather than breaking it with my quads. I took water/ gatorade at every station (they were so great with announcing what (water vs gatorade) was where and took Honey Stinger gels every 5 miles. I alternated between caffeinated/ non-caffeinated at every 5 mile segment. This is how I had practiced and also what I found works best for my body. 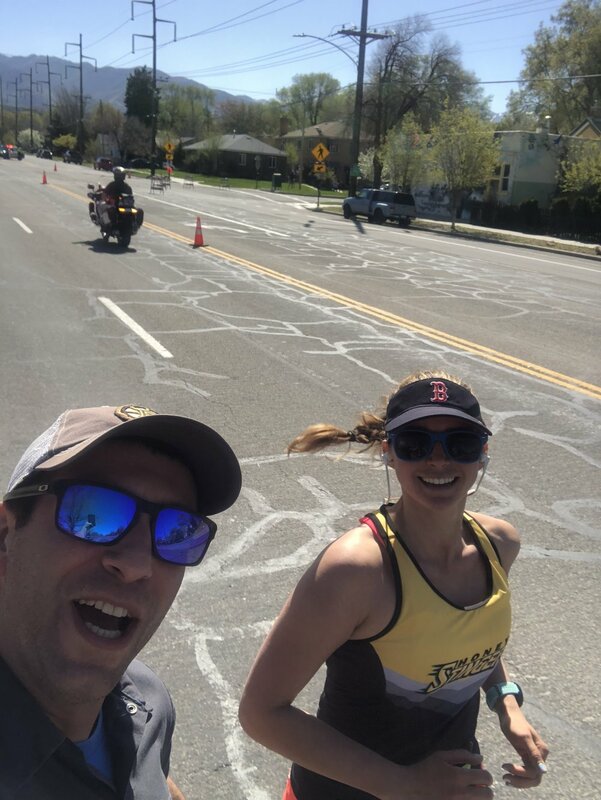 The half & full marathoners started together, but we ended up splitting off around mile 11 and that's when the real work began. We were immediately were faced with a pretty steep hill (I was prepared for the rollers in miles 8-14 & another one expected around mile 20-21), there was no going back now! The sun started to hit us around then, but thankfully there was a bit of a headwind to cool us down. I focused on leaning into the hills and relaxing my shoulders. Around mile 13 or 14 (I can't remember), we entered one of the two parks that we ran through and I needed to do a quick Shalene Flanagan-style pee break. I think maybe it took me 11 seconds total before I was out running again! I still felt great at this point and the crowd support was incredible! We were in the park for several miles, so when we were coming out it a spectator told me to relax my hands (at least I think he was talking to me) and that helped SO much! I continued to think about relaxing my hands from then on! At this point, I was still feeling great and keeping a rather comfortable pace around ~8:35/ 8:40. I started passing a lot of people (which never happens to me during a marathon normally) and that felt fantastic (because I got passed considerably during the first half). I smiled and hit posters that had the words "hit here for energy" and high-fived the chik-fil-a cows and waved to the older spectators sitting on their lawns cheering along. I'm not going to say this was my happiest marathon (because Rock n Roll Vegas is SO much fun), but it was very close to being a 26.2 party! Before I knew it, we were getting close to mile 24 and I STILL didn't have any music on! 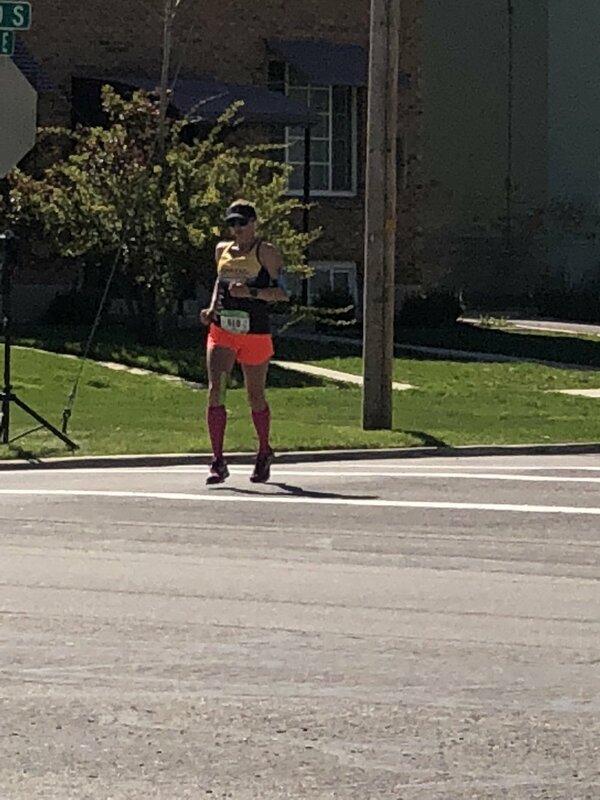 I had listened to the Ali On The Run Show's podcast with 2nd place finisher, Sarah Sellers (wanted something to keep my pace in control and not pump me up too much) and that finished by mile 5 and I didn't put anything else on. With 2 miles to go, it felt appropriate to put some music on to hit some fast paces for the last 2.2 left! I actually ended up getting into 7:5x pace in mile 24, which is just INSANE! Alex ended up surprising me at mile 25 and snapped the photo below. I felt relaxed, excited, and honestly just loving life! I sprinted into the finish line (still passing a few people, including half marathoners) and didn't feel gassed after I crossed the line. I wanted to keep going! I've never felt so strong throughout a race and cannot believe that an 8:52 average pace felt easy. This gets me REALLY excited for my next race, when I will actually push the pace and race!